So I’ve been posting on Facebook pretty regularly and I’ve given updates and commented and replied to some folks on other social media channels and via texts but now that the storm has passed and the shutters are mostly down and all has been checked and verified, here’s the rundown on the biggest Hurricane I’ve ever ridden out in this crazy place I call home. Yes, it’s crazy, yes I love it, yes it’s home. Always. Home. To be clear, I am truly protected by Angels. That’s the only explanation I have for this weekend… divine intervention is pretty much the only thing that comes to mind. And mind you, I’m definitely not a religious person. But if you know me you already know that and we won’t go into it right now. But suffice to say that I am blessed. For those of you who don’t know, I either own, rent, or borrow 3 homes in Punta Gorda and Lakeland. So when Hurricane Irma started making her way here I took care of the Punta Gorda plan and sent lots of texts and made lots of calls to the roomies on how to prep the Lakeland house to survive the storm. By Saturday morning the two in Punta Gorda were fully shuttered and/or boarded and the Lakeland house was far enough inland to not be a concern. Then I heeded the call and got out of town. So… long story short… at the end of the storm every one of these homes ended up being within 30 miles or less of the eye of the hurricane and NONE had any damage at all. Oh wait, I forgot! There was one broken candle holder in my home in Punta Gorda that apparently was pushed off a window ledge at the height of the storm due to the window vibrating. Well, that’s what I think happened. Truly I can only guess because – duh! – I wasn’t there. 6 to 8 feet of projected storm surge pretty much guaranteed that. So I weathered the storm fine personally… without electricity from Sunday around 8am to Monday when I packed up and left to return home… but I’m pretty damned sure I never want to spend that many hours watching trees bend in positions that they were never designed to bend into. And the noise… lawd the noise. 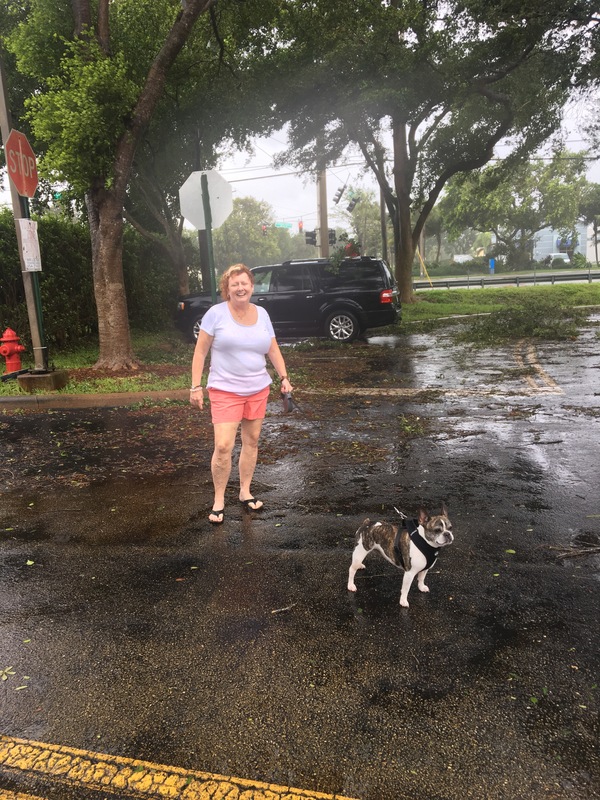 Every bang and bump had me saying “what the hell was that!” But finally late Sunday night it was over in south Florida… and then when I got back to Punta Gorda on Monday afternoon I found that everything there was completely unscathed. Nothing missing, nothing damaged, and the condo even had power. Of course I did find that my friend’s boat was definitely trying to jump the building… stern-heavy isn’t a good thing in a hurricane, make a note… but from the condition of the freezer the power at the condo wasn’t even out long… the ice cream didn’t even thaw FFS! And as for my home in Lakeland… wow. The pictures are amazing. 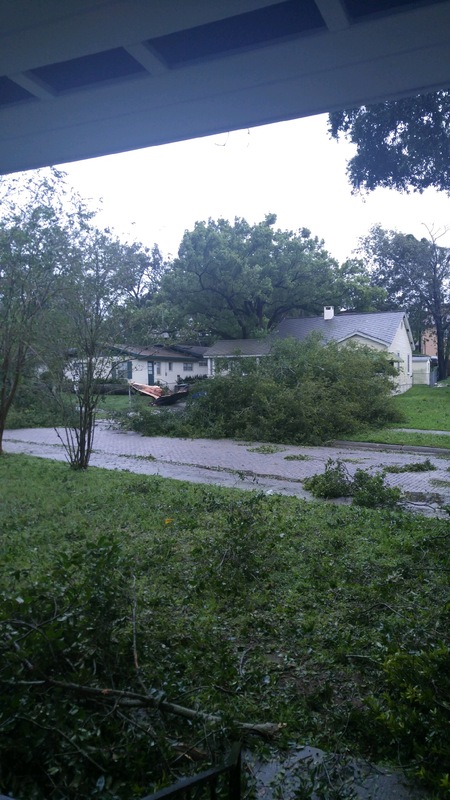 There are so very many trees down all over the historic district and Lake Hollingsworth, including a great big one right across the street from my house and yet my beautiful oaks stood the worst of the storm and are still standing. 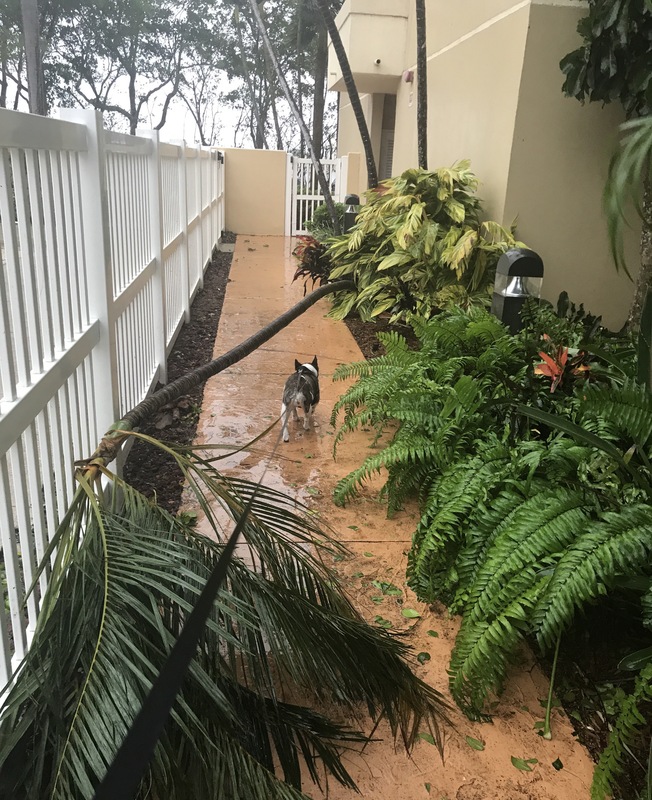 I lost a few screen panels in the pool cage and an errant branch was thrown through one of them (thanks Irma – that’s pretty petty of you), and I currently have 3 panels of Privacy Fence that are laying down on the job, but there was no roof damage, no leaks, and my roomies did a fantastic job of keeping everything together… in their first hurricane, because they were already #Detroittough and now they too are #Floridastrong. So Lakeland took a surprise hit and Punta dodged a big bullet with storm surge that was less than half the projected amount and at the end of the day all is well. Honestly I hope I don’t have to live through 24 hours like that again. Evacuation was a good plan, especially when I was coming back through Naples on I-75 yesterday. 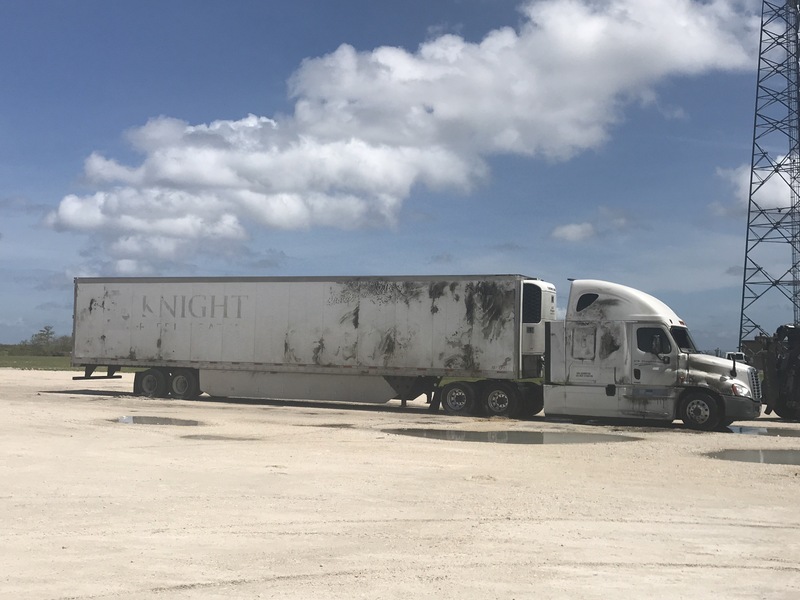 TBH the semi laying on its side at the truckstop in Alligator Alley was pretty epic but the bigger story is that everything survived… and I’m so proud of our state and how we did it with humor and grace and generosity. An example, I found gas yesterday morning south of Miami at a Costco but I don’t have a card. The man in front of me in line not only let me use his Costco card but also tried to pay for my gas. Seriously. Because #Florida. Weird, wild, wonderful Florida. The place I can’t quit. The place I love. The place that will always be home to my heart and soul. Even if it’s also the place that periodically tries to kill me. No, not kidding… when I got back to the condo I found a baby Rattlesnake coiled up at the gate. Apparently he needed shelter from the storm? I’m just hoping the rest of his siblings aren’t lurking around anywhere else… and BTW thanks Mr Fireman for conveniently showing up to take the shovel and relocate that displaced resident to his proper home. He’s apparently endangered. And his place on the list moved up when I found him here. But in the end everything survived. Even the damned rattlesnake. But most especially all of the people I love and the places I call home. And now I too am back home. So everyone stay #Floridastrong… everything will be back to normal very soon. Or as normal as it ever gets down here. Meanwhile Boat Drinks for everyone! We’ve earned it!